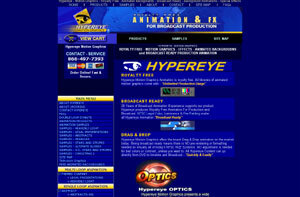 Hypereye Motion Graphics offers the truest Drag & Drop animation on the market today. Being broadcast ready means there is NO pre-rendering or formatting needed on virtually all of today's NTSC NLE Systems. NO adjustment is needed for bad colors or contrast, unless you want to. All Hypereye Content can go directly from DVD to timeline and Broadcast 20 Years of Broadcast Animation Experience supports our product. Hypereye produces Royalty Free Animation For Production and Broadcast. NTSC Legal Color, Luminance & Pre-Fielding make all Hypereye Animation "Broadcast Ready". HYPEREYE MOTION GRAPHICS is committed to you with the highest quality of royalty free animation content and the best service. To do this, we would like to let you know that we'll always be here to answer any of your questions to the best of our abilities. If you have a question regarding any of our motion graphics, animated backgrounds, digital video or animation art, please submit them to any of the email links below. As well, please feel free to call us, we'll be glad to help in any way we can.